XSL Speed Reporter: Are the Days Numbered for Auto Racing on Streets of Toronto? Are the Days Numbered for Auto Racing on Streets of Toronto? 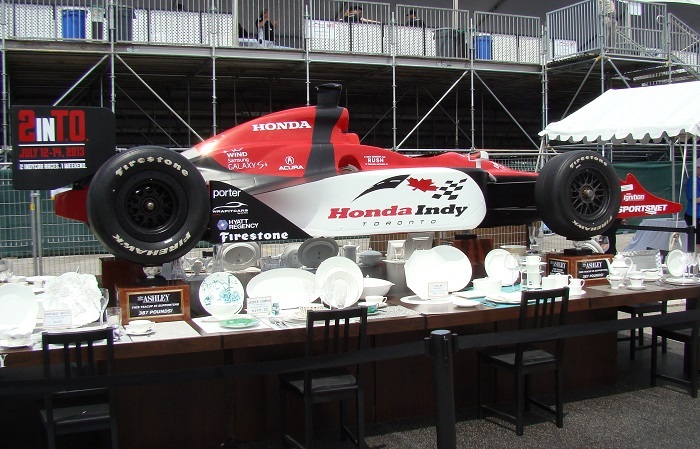 This year’s Honda Indy Toronto closed on a high note. Headlined by the IZOD IndyCar Series’ first doubleheader event on the streets of Toronto, we have seen two action-filled races where Scott Dixon came out on top with a $100,000 bonus for sweeping the weekend. The first standing starts in the IZOD INDYCAR Series on Sunday also provoked an extra tone of excitement for race fans. With the 2013 edition of the July weekend motorsport near-tradition is in the books, the future of the auto racing on the street course could be altered. Last renewed in early 2012 through to the 2014 season, there is a possibility that the same thundering roar of engines may not be produced by the waterfront location. Originally called the Molson Indy, the most of North American open wheel racing has catered to established auto racing fans and won over so many others since 1986. Back then, the CNE grounds was a more bustling location for entertaining Canada’s largest city. The Toronto Blue Jays were still playing at a stadium on the land, the Canadian National Exhibition was larger and nearby Ontario Place provided all the reason for the area to be a go-to place for fun. For better or worse, the Blue Jays have long been playing at the Skydome (Rogers Centre) while Ontario Place is currently an unattended island. Despite this, one ongoing event has been held 26 times in 27 years has been a modern mainstay that has both noise to property lining Lake Shore Boulevard. Cancelled in 2008 due to the Champ Car series merging with the Indy Racing League, the race returned in 2009 through the intervention of a seven-time Toronto event winner Michael Andretti. Assuming the title Honda Indy Toronto, shaky Champ Car fields prior to 2009, a one-year absence and an economic downturn led to a less impressive spectator count for the race headlined by the IZOD INDYCAR Series. Crowds have been gradually returning to the race event (although real number to confirm this have not been released by the less-than helpful race promoters. 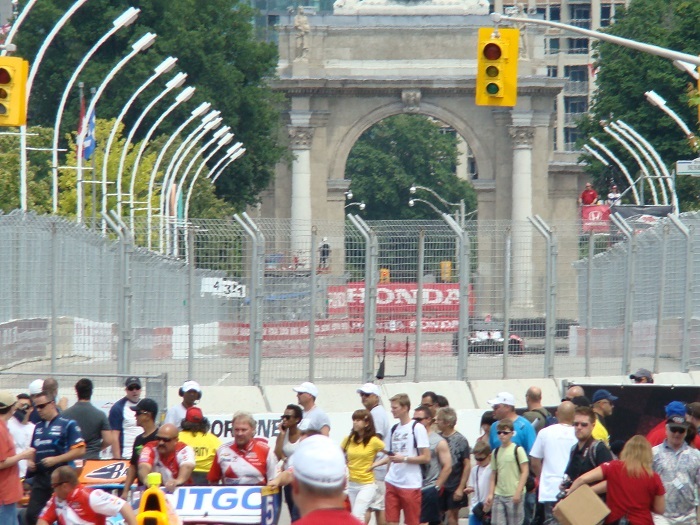 attendees and television viewers of the 2013 Honda Indy observed near full grandstands within a crowded CNE grounds. Toronto has been a city undergoing a major metamorphosis. Thanks to high property values, every parcel of land in the city is seen as the next condominium development or big box store location. Until a city council vote put the kibosh on the Toronto casino plan, the CNE grounds was being eyed as a location for a gambling-related resort area. This move would have undoubtedly prompted the immediate end of the Honda Indy Toronto (at least in its current location). Even Scott Dixon noted the high-rise development during the Sunday press conference after the 2013 Honda Indy. It is widely suspected redevelopment of the Ontario Place grounds could involve the addition of new condominiums or other buildings. Part of it is already stated to be reimagined as a giant green space that will still require the movement of heavy equipment in and out of the Ontario Place grounds. Construction that has gripped the city could cause a rethinking of the Honda Indy Toronto’s route. With a 2017 target date set for Ontario Place refurbishing, part of the land is slated to be used for the 2015 Pan Am Games. Hosting one of the largest, international multi-sport gatherings behind the Olympics, the Pan Am Games will run July 10 through to the 26 (squarely within the Honda Indy Toronto‘s typical dates). Though the two events are significantly different, it could prove difficult to stretch City of Toronto resources for a pair of major sports. It is possible the Honda Indy Toronto and Pan Am Games will divide attention for three days (not including the pre-race activities). Without an announcement for a contract extension, the Honda Indy Toronto may be faced with cancellation or relocation in 2015. Where the Honda Indy Could be Held in 2015? Throughout the running of the racing festival on the streets, closing down a stretch had not been popular for non-race fans. While many Toronto festivals involve street closures, the Honda Indy Toronto has been earning distaste for some since it causes traffic interruptions for multiple days consecutively. If the long-used CNE grounds would be unavailable, the IZOD IndyCar Series and other support series could presented near Toronto with two options involving no street closures. The first future venue choice could be the Canadian Tire Motorsport Park (traditionally known as Mosport). Serving as a venue for the USAC open wheel series four times from 1967 to 1978, recent development of the road course facilities around the 2.46-mile track has been underway. Along with hosting sports car racing and other national racing series, Canadian Tire Motorsport Park will be hosting its first NASCAR Camping World Truck Series Race late this summer. 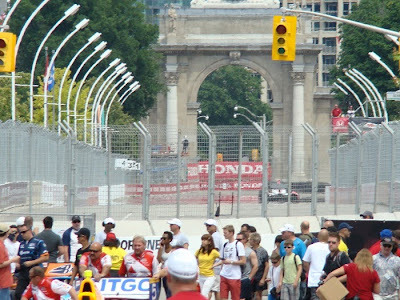 Would the road course prove as welcoming to IZOD IndyCar fans as the street circuit in the heart of downtown Toronto? From the oldest-operating track in Canada to what will be the newest, Canadian Motor Speedway under construction right now in Fort Erie is more than a one and a half hour drive from Toronto but have the potential of treating IZOD IndyCar fans to oval track racing on our home turf. The one-mile oval serving as the centerpiece of the project will host a grandstand capacity for 65,000 spectators. A 2.5-mile road course is also part of the Canadian Motor Speedway complex. While the Honda Indy could be moved, there could be a strong likelihood the race may stay by the Toronto waterfront. It would be a shame the electric weekend of this year’s event would cease being a part of a Toronto summer.